Great move by the Hatch family. It's good to know that potential archaeologic and paleontologic resources will be available for discovery. It would be tragic if the potentially valuable potash deposits were to locked up. Unfortunately, development of potential mineral resources in similar situations is precluded far too often. I think the staff of the Petrified Forest Nat’l Park and Hatch Family Limited Partnership are aware of the effect of mineralization on the surface property. It can weaken the land because land density is reduced. 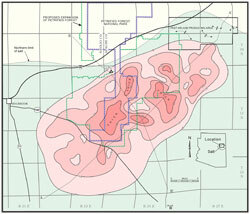 So, it would be wise to think carefully to whom the mineral rights of the land would be sold. Otherwise, the park can be greatly affected by the mineralization.